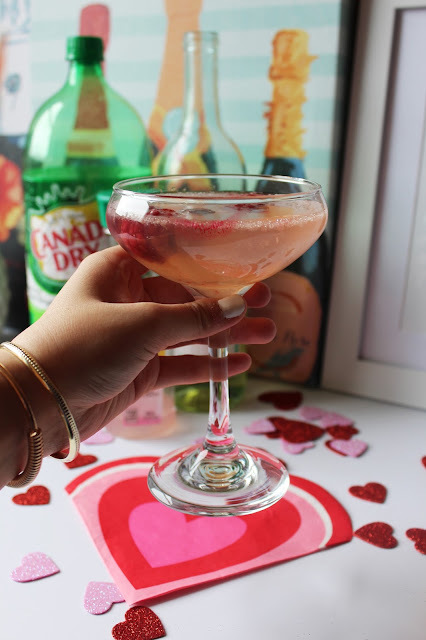 Any holiday that gives me an excuse to whip up a fun drink is a holiday I like! 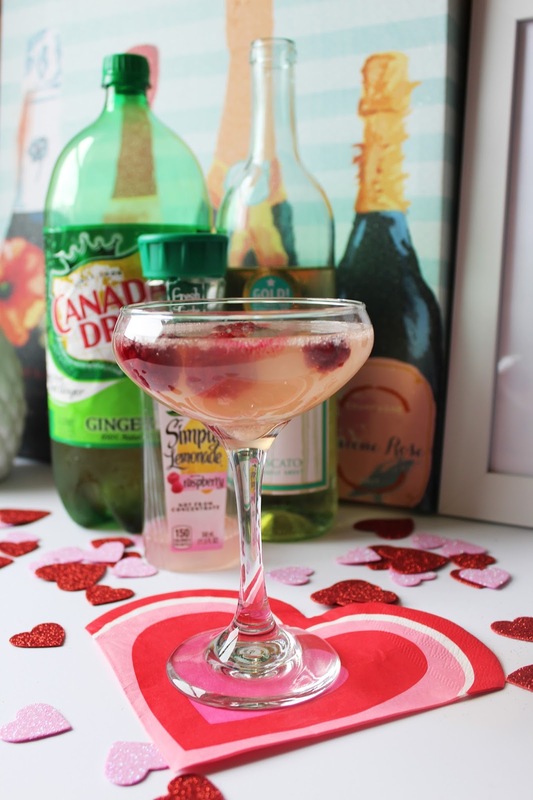 So today I'm bringing you a festive Valentine's Day drink! It's sweet, fruity and a little fizzy that's perfect for brunch, dinner or just with your girls and a good rom-com! Plus, it couldn't be easier to make only using 3 ingredients. Annnd it's a gorgeous blush pink color, appropriate for the romantic holiday. So let's get to how you can whip up this fun cocktail! 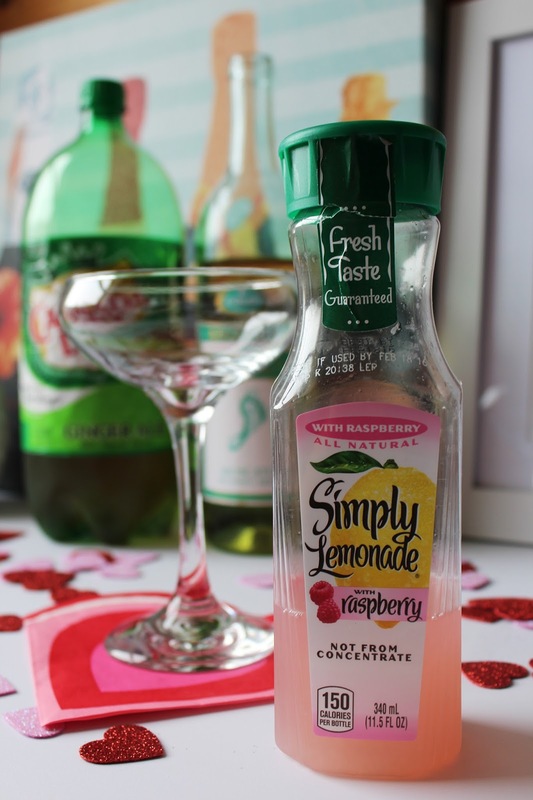 For this cocktail you're going to need raspberry/strawberry lemonade, ginger ale or lemon-lime pop, a moscato and frozen raspberries/strawberries for garnish. First add your lemonade. I don't really measure out exact amounts but do more of a pour until it reaches the amount I want in the glass kinda amount. 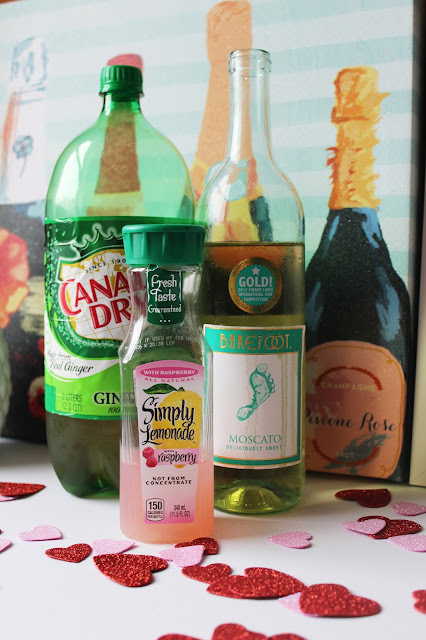 A general rule of thumb is 2 parts wine to 1 part juice and pop. But that's just me. If you like more juice you can do more juice or more fizz you can do more pop, it's completely up to you and what you like! Next add in your moscato. 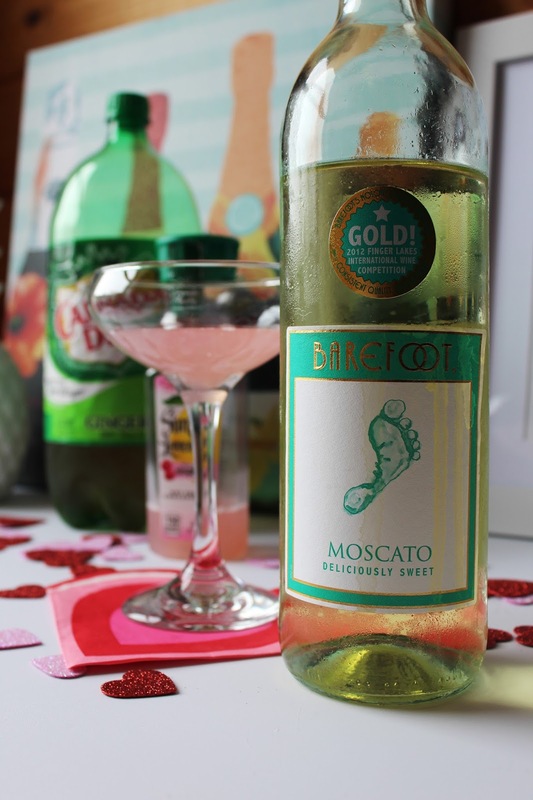 My favorite moscatos are Costello del Poggio, Cupcake Moscato d'Asti and Barefoot Moscato. The Costello and Cupcake are around $10.99 a bottle and the Barefoot is $5.99 BUT in my opinion the Costello and Cupcake are more sweet than the Barefoot. For more of a pink color you could use a pink moscato or a rose. And top it off with a little fizz. I like ginger ale so I use it but you can also use a Sprite/Sierra Mist. 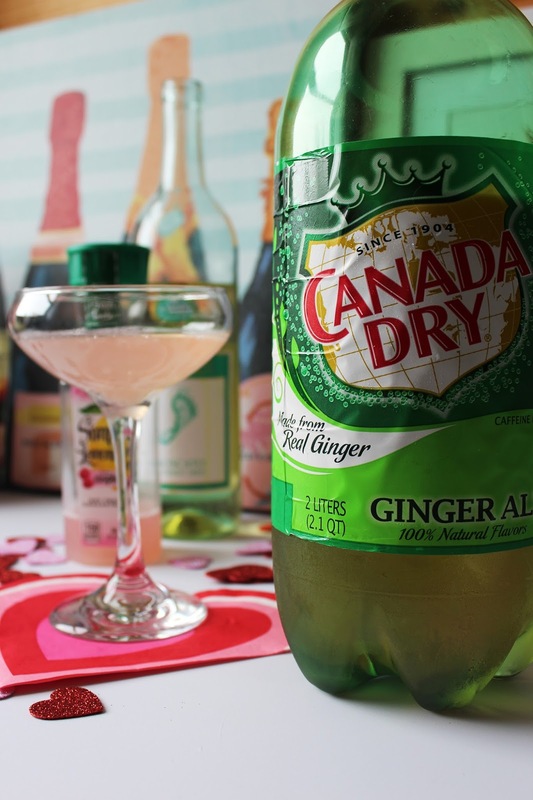 The ginger ale does change the color of the drink just a little bit since it is more of a tan color so if you want a really blush pink drink stick with a clear pop. 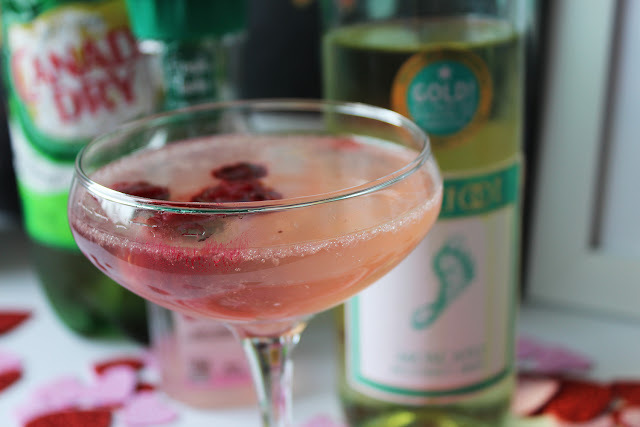 Garnish with some frozen raspberries or strawberries and serve! How stinkin easy was that? It looks super pretty and tastes just as good as it looks! This is actually my go-to drink when I'm at home relaxing with a movie or working on a blog post. I was drinking it the other night and realized what a pretty pink color it was and how perfect it would be for Valentine's Day. And thus this post was born! 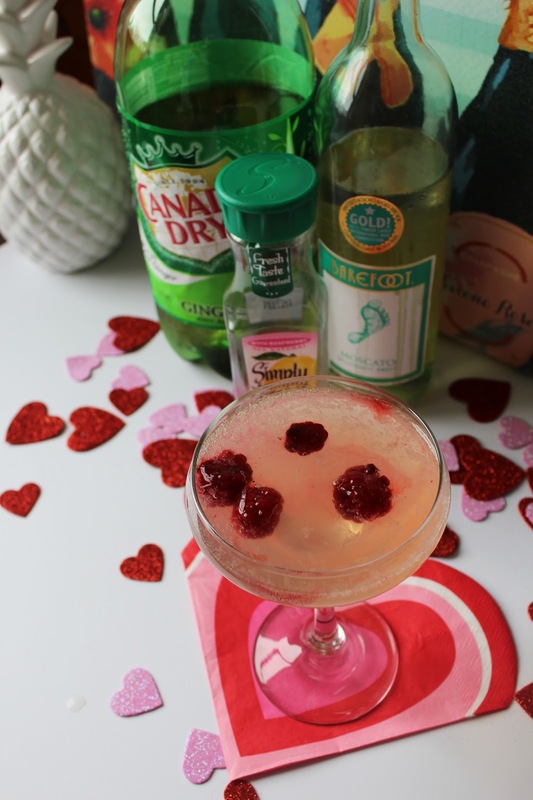 If you recreate this cocktail for any of your Valentine's Day plans I'd love to see it and your thoughts on it! Send or tag me in the photo on Instagram and Twitter (@samantha_goble) for both! What are your Valentine's Day plans? Anything fun or romantic? What's you're V-Day drink of choice? Have any funny Valentine's stories? Share them below!